Goldman Sachs burnishes its image as promoting women through lending programs and awards sponsorship. But the number of women on its board of directors has stalled out at two since 2004. Goldman Sachs has just two women on its 11-member board of directors, or 18%, ranking the firm 358th in the Standard & Poor's 500 Index of U.S. companies. Goldman Sachs Group Inc. (GS - Get Report) is an old boys' club -- in the boardroom. The Wall Street firm, which publicizes its efforts to promote women entrepreneurs around the world and hire more female professionals, has just two women on its 11-member board of directors. The percentage of female directors, at 18%, ranks the firm 358th in the Standard & Poor's 500 Index of large U.S. companies, according to an analysis by BoardEx, a relationship-mapping service of TheStreet Inc. The ratio also pales in comparison with that of some other big U.S. financial firms, including Wells Fargo & Co. (WFC - Get Report) at 42%, Bank of America Corp. (BAC - Get Report) at 33% and Citigroup Inc. (C - Get Report) at 31%. For a firm that prides itself on cutting-edge investing savvy, Goldman's record on boardroom gender diversity looks increasingly behind the times - potentially hurting its own shareholders, since a growing body of research has shown that boards with more women are better at decision-making and bring higher financial returns. Goldman's overwhelmingly male board will be on display Wednesday at Goldman's annual meeting, when shareholders will vote to ratify directors for the coming year. The thesis that a higher percentage of female directors can improve corporate performance is supported by an organization called the 30% Club, where the CEOs of Goldman's three biggest shareholders -- the money managers BlackRock Inc. (BLK - Get Report) , State Street Corp. (STT - Get Report) and Vanguard Group - are members. Another member is Warren Buffett, the billionaire CEO of Berkshire Hathaway Inc. (BRK.A - Get Report) , another big investor in Goldman's shares. The scarcity of women at the top echelon of Goldman is significant given the firm's position at the epicenter of global finance, and as a symbol of modern American capitalist success; it perennially ranks as the No. 1 adviser to corporations on mergers and acquisitions globally. In recent decades, the Wall Street firm has also produced no fewer than three U.S. Treasury secretaries - Robert Rubin, Henry Paulson and Steven Mnuchin, who serves currently under President Donald Trump. In a March regulatory filing, Goldman said that boardroom diversity is "an important factor in our consideration of potential and incumbent directors." Yet as more U.S. companies have pushed in recent years to increase the presence of women on their boards, with a heightened emphasis following last year's #metoo movement, Goldman has made zero progress under Chairman and CEO Lloyd Blankfein, 63. In fact, women's presence on the Goldman board has stayed constant since 2004, when the number of female directors doubled to two under Paulson, who at the time served as chairman and CEO. And it's not just Goldman shareholders who depend on the board, since directors oversee its risk management. The New York-based company has been designated by regulators as a global systemically important bank, indicating that a collapse of the firm - a fate that befell Bear Stearns and Lehman Brothers during the financial crisis of 2008 - has the potential to imperil financial markets and the economy. 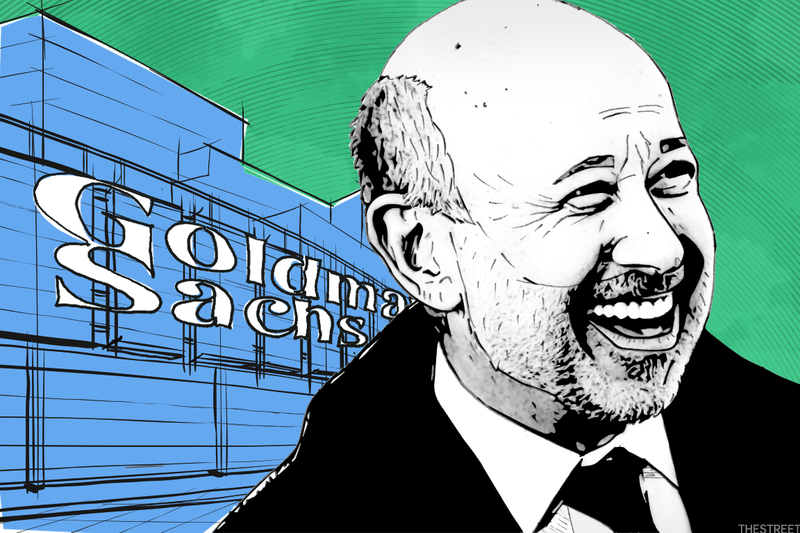 Goldman survived the crisis by getting a multibillion-dollar bailout from the Treasury Department, and it converted from a brokerage firm into a bank on an emergency basis to get access to rescue funding from the Federal Reserve. "There is certainly an opportunity to enhance the cognitive diversity at Goldman Sachs by adding more women to the board," said Betsy Atkins, CEO of the venture-capital firm Baja Corp. and a board member at publicly-traded companies including Cognizant Technology Solutions Corp. (CTSH - Get Report) , Wynn Resorts Ltd. (WYNN - Get Report) , and SL Green Realty Corp. (SLG - Get Report) "There is an ample pool of world-class talent if that is a priority, and I think it would strengthen board oversight and be a positive for shareholders." 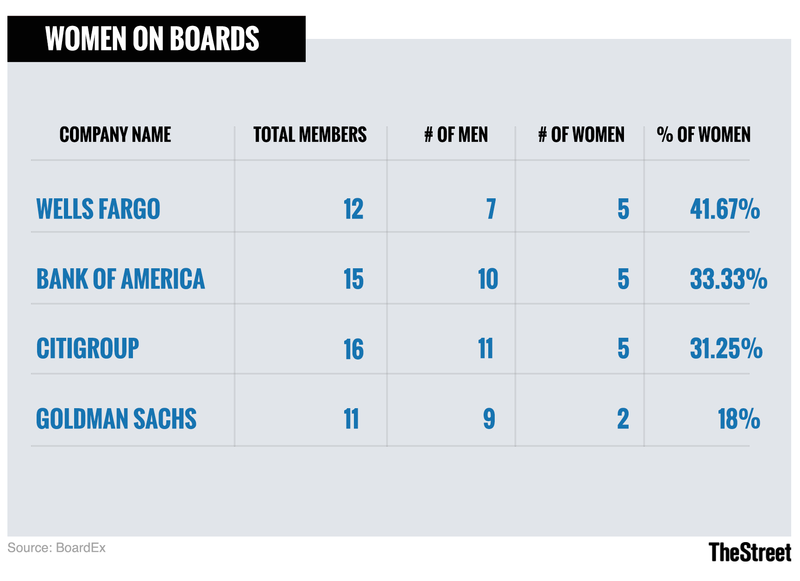 Wall Street firms' board composition, by gender. While it's impossible to say whether a higher percentage of women on the Goldman board would have led to improved performance last year, numerous studies have shown that companies are more profitable and have higher shareholder returns when they have a fairer balance of women on their boards. The theory is that diverse perspectives help to foster healthier debates within boardrooms, resulting in more effective strategic decision-making and potentially higher long-term growth. And the difference becomes clear when a board has at least three women, ensuring that their contributions will be fruitful. "While a lone woman can and often does make substantial contributions, and two women are generally more powerful than one, increasing the number of women to three or more enhances the likelihood that women's voices and ideas are heard and that boardroom dynamics change substantially," three researchers, Vicki Kramer, Alison Konrad and Sumru Erkut, found in a 2006 study. BlackRock, the largest U.S. money manager with more than $6 trillion of customer assets, said earlier this year that it wants publicly-traded companies to have at least two female directors on every board. Goldman meets that test, but fails the 30% Club's goal of having roughly 30% of directors - at the least -- be female. Larry Fink, BlackRock's CEO, is a member of the organization. Even Wells Fargo, the San Francisco-based lender sanctioned in recent years for abusive practices toward its own customers, recently increased the percentage of women on its board to 42% from 33%. Blankfein, who took over as chairman in 2006 when Paulson left to become Treasury secretary, recently chose David Solomon from among two male co-presidents to succeed him when he retires; no timeline has been given for the handover. The announcement came as Blankfein faced criticism from some analysts over subpar results in 2017 at Goldman's historically best-in-class trading division. Over the past 12 months, Goldman's stock price has increased 6.5%, compared with a 11% gain for the S&P 500. A Goldman Sachs spokeswoman declined to comment or make Blankfein available for an interview. Goldman Sachs Director Ellen Kullman. 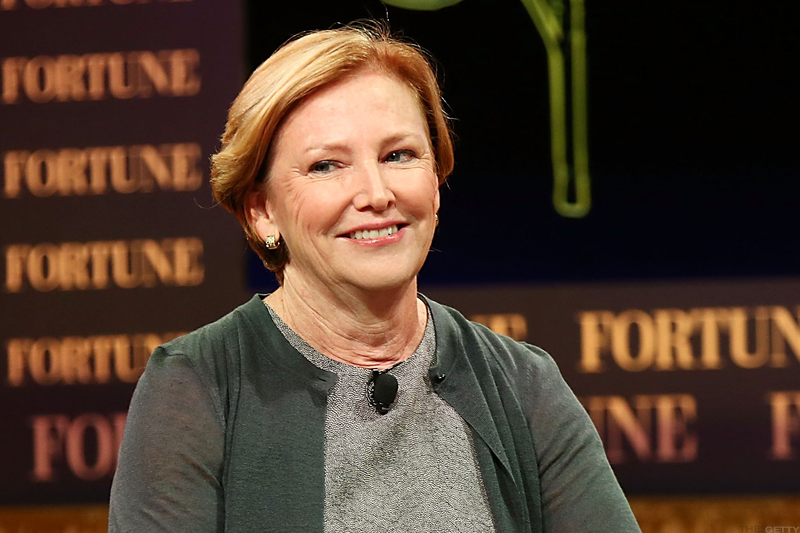 Both of Goldman's female directors are former corporate executives with extensive board experience: Michele Burns, 60, a former CEO of human-resources consultant Mercer, who joined in 2011; and Ellen Kullman, 62, a former CEO of chemicals-maker DuPont, who joined in 2016. Goldman briefly had three female board members in early 2017, though the number dropped back to two following the retirement that April of Debora Spar, a former Barnard College president who had joined in 2011. So in that sense, Goldman has gone backward. The company had an opportunity to add at least one woman to its board this year through a regular "refreshment" process designed to encourage turnover of long-serving directors. Instead, the board granted director Bill George, a white man who has served for 15 years, a waiver from the recommended retirement age of 75. According to the regulatory filing, the decision was based on the recommendation of the board's governance committee, headed by Adebayo Ogunlesi, 64, a Nigerian-born former investment banker and Harvard Law School graduate who now runs his own private-equity firm, Global Infrastructure Partners. Ogunlesi didn't return an e-mail seeking comment. It's not like Blankfein doesn't know where to find talented businesswomen. In 2008, the company started a program called 10,000 Women to provide female entrepreneurs with business-management education, mentoring, networking and access to capital. To date, the program has reached more than 10,000 women from 56 countries, according to Goldman's website. Then in 2014, Goldman set up a fund alongside the World Bank's International Finance Corp. to lend money to banks in emerging markets like Brazil, India, China and Kenya, so those banks could in turn make loans to small- and medium-size businesses owned by women. And every year since at least 2012, Goldman has sponsored a "Global Women Leaders Award," given out at a major women's business conference hosted by Fortune magazine. Blankfein himself gave out the award in 2016, according to the conference website; Solomon gave it out last year. The company also has set a goal of having women eventually represent 50% of its global workforce, starting with a targeted 50% of its incoming class of entry-level investment-banking analysts by 2021. But there's been no similar goal set for the board. Charles Elson, director of the John L. Weinberg Center for Corporate Governance at the University of Delaware (named after a former Goldman Sachs chairman), noted that while the Wall Street firm doesn't get the worst grade among public companies on female board representation, it's certainly not a leader. "You'd rather them be in a better spot," Elson said in an interview. "This wasn't an issue 10 years ago. Today, it's become more of an issue."